The Moto X smartphone: We have consensus – Technology… in PLAIN ENGLISH! 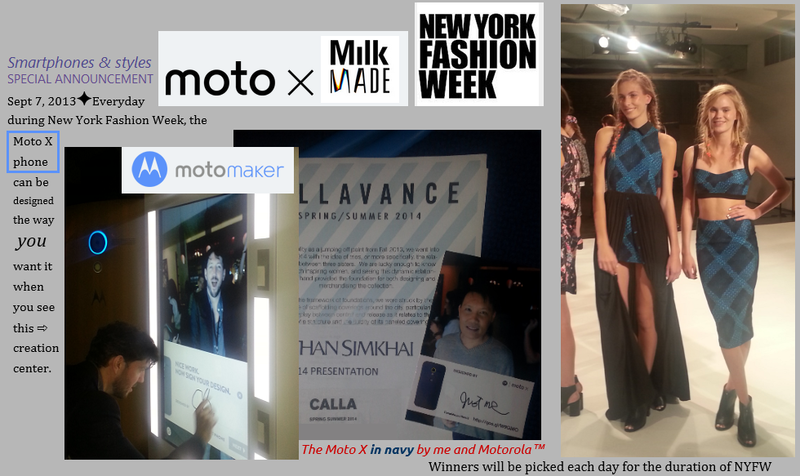 UPDATE (Feb. 7, 2014): From one Fashion Week to another, changes are swift! 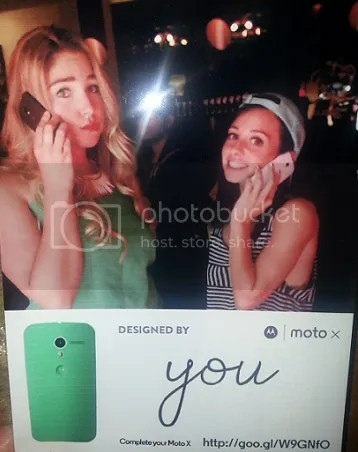 When I first wrote this article during Fashion Week (Sept. 2013), the Moto X smartphone by Motorola Mobility was a Google product. Well, right on schedule, Fashion Week’s rolled into town again (started yesterday, Feb. 6, 2014) and faster than you can say “last season”, the tech world was taken by surprise with the announcement about Lenovo taking over as the new parent company of Motorola Mobility. If you were thinking of buying this phone but weren’t thrilled it was tied to Google, don’t be too quick to act on the “owned by Lenovo” fact, because the Moto X is still an Android phone. For this reason, it will always have ties to Google. Anyhoo, months later, we’ve got consensus on the phone itself from highly opinionated users. Here it is: The Moto X has good battery life, the price isn’t bad, and it’s got an innovative quick-access camera found on no other phone. The average pic quality created by the camera has gotten the most criticism so far. It’s a pity because it would be a great phone otherwise. Let’s see if Lenovo’s leadership will even bother with stuff like Fashion Week the way Google did. It’d more sensible if Lenovo would try to get a better camera into the Moto X if it gets refreshed, which I’m guessing it will. A few weeks ago, tech giant Google presented the American market with the Moto X smartphone, a compact phone by Motorola with 4G LTE, integration with your existing Google accounts, remarkable battery life, auto brightness for indoor and outdoor use, ultra-fast startup and twist-of-the-wrist access to the 10-megapixel ClearPixel camera with LED flash, voice commands, X8 architecture, unibody design, dual-core processor, 720p/316 ppi 4.7-inch AMOLED display, Google Now, Android Jelly Bean, 1.7GHz dual-core Qualcomm Snapdragon S4 Pro processor, quad-core Adreno 320 GPU, and 2GB of RAM. The Moto X comes with exclusive bonuses like Moto Migrate for transferring files out of your old phone, and Motorola Connect to work with your Chrome browser. The Moto X is coming to all major American carriers, namely AT&T, Verizon, Sprint, U.S. Cellular and T-Mobile. You can get it in 16 or 32GB models, and it comes in a rainbow of custom colors. Choose from 18 main colors, 7 accent colors, and 2 front plate colors. If you prefer, you can get it in a wood exterior, however you’ll need to wait because wood isn’t available before 4Q 2013. You can further customize the wallpaper and launch screen. For now, this customization is exclusive to AT&T via the Moto Maker web app, but after awhile other carriers will offer customization too. If you visit an AT&T store and ask to see the colors in person, someone will be glad to show you as well as walk you through the website where you can place your custom order. It will then be mailed to you. Moto Maker allows you to design your own Moto X anytime you want, even from home. Or you can try the new promo called Moto Match which allows Facebook users to design a phone according to the color schemes of their favorite Facebook pictures. Measuring 5.09 x 2.57 x 0.41 inches, the back of the MotoX is slightly curved for a nice hand feel. Another good thing is there’s no physical home navigation button which is characteristic of Motorola Android phones. The hands-free voice commands are another plus – It somehow recognizes your voice and ignores other voices and sounds as brand ambassador, Tierney, demonstrated. Engadget reported that even after a full day of heavy usage, the Moto X’s battery indicator reading was at 28 percent. It also has a battery saver mode, but from the many reviews I’ve read, it doesn’t sound like it’s even necessary because the phone is engineered to provide ample battery life right out of the box. The writers at Engadget go into detail about what they consider heavy usage, which is nice. 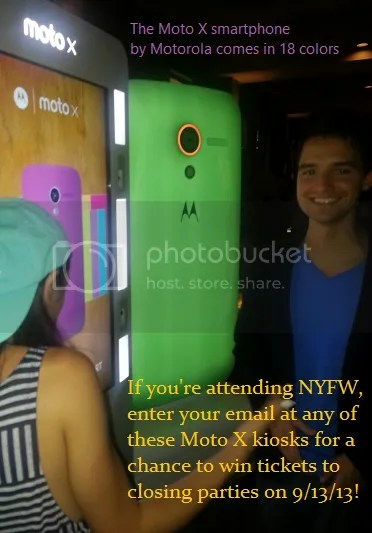 Throughout New York Fashion Week, whenever you see Moto X booths, you can play around with color and wallpaper combinations, add a signature, get a preview printout, and you’ll be prompted to enter your email to win tickets to the hip and chic closing festivities arranged by MADE and Motorola. Use hashtag #MOTOxMADE on social media to keep up with the buzz. The creation booth also allows you to complete your custom Moto X order from the comfort of your own home via a later specific-to-you email. All you do is click if and when you’re ready to start the purchase process. You’re under no obligation to buy when you type your email into the booth. For the Sept. 13 MADE finale, one winner per day will be chosen for the duration of New York Fashion Week 2013. I think the battery life will be a big positioning element. I hate always being stressed about my phone battery length on the weekends. Oh, I know that feeling daily!